We personalize TAGGIES™ blankets with a name, monogram, and date, in your choice of font and thread color. Babies and kids love to rub satin edges, clothing labels and tags. Each tag on all Taggie looks or feels different. We call Taggie an 'interactive blanket' because a Taggie provides the child with both an exciting activity and at the same time it is their cuddly, soft security blanket. Personalization is optional and is offered in a large selection of font styles and embroidery thread color options for a truly unique personalized gift. Little Leaf Elephant is designed with neutral colors which makes this taggie perfect for all babies. Little Leaf Elephant sits atop this embroidered, fully lined, satin trimmed and backed baby blanket. Exciting and vibrant colors create this perfect cozy blanket. Baby will love the satin tags attached around the edge of the blanket and monkey. 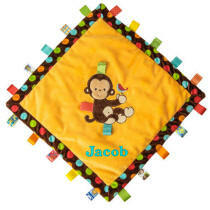 Wow, we just love all the colors on this dazzling Monkey Character Blanket! This square blanket has a monkey head right in the center. He has some great looking satin tags to rub. Around the edge of the blanket there are even more tags, plus the back side of the blanket is satin too. What heaven for a little baby to rub! We embroider across the corner of this blanket to create a wonderful personalized gift. Machine washable. Size 13 in x 13 in. Lightly padded, with a smoth and silky satin back, and comforting fleece front. Beautifully appliqued with an adorable owl design. This quality baby blanket will be well loved by baby - she will love the colors, the textures, and especially love the Taggies tags attached along the outside of the blanket, and on the owl. 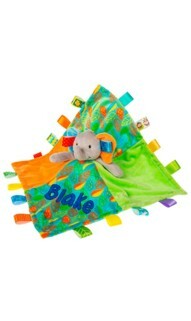 We can personalize this Taggies blanket with baby's name embroidered across the corner. Size 16 in. x 16 in. Soft pastel colored owl blanket is part of the Taggies signature collection. The Taggies enhance baby's emotional well being. The tags are interactive and soothing, the fabrics comforting, the colors visually stimulating. 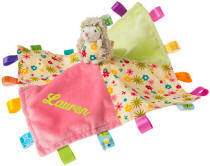 We personalize this baby blankie with baby's name embroidered across the corner. Lightly padded, this fleece blanket is cuddly and soft. Signature Taggies tags are attached along the edges and on Buddy dog's ears. Baby will love all the neat textures, colors and whimsical applique. Add his name embroidered across the corner, and his birth date it desired, to create a personalized baby gift that will be well loved by baby and mom alike. Machine washable. Size 16 in. x 16 in. The perfect size for baby to tote around. Cute puppy head with tags is in the center of this blanket. Blanket is edged in signature Taggies satin tags, and appliqued with buddy the dog. We personalize with an embroidered name. 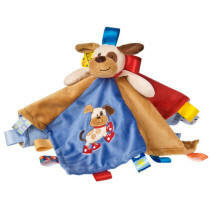 Every baby loves their tags, so this character blanket is a must have. This newest design of a cute hedgehog with flower petals on her tummy attached to the center of the blanket will bring comfort to your baby.